Our Specialty shape options help us treat a variety of challenging architectural designs found in today’s construction. We have solutions for Arches, Eyebrows, Ovals, Octagons, Hexagons, Circles, and Rake top openings to name a few. Although Shutters and Honeycomb shades are most commonly used for Specialty shape solutions we have several products in our lineup that also offer solutions for difficult shaped windows. 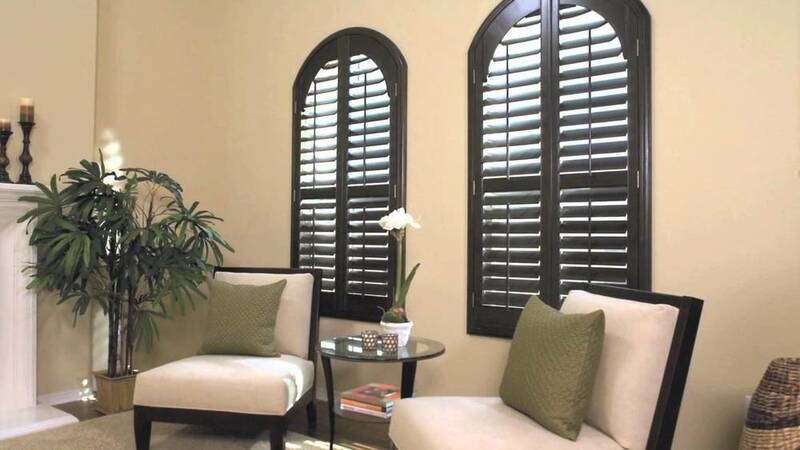 If you have unorthodox windows, we have the custom shutter solution for you. Whether you have circular, semi-circular, or other types of windows, we will work closely with you to discover the right fit. Sunburst™ Wood Arches filter a soft light to enhance your arched window. Similar to the SlatburstTM wood arch, with ¼" slat openings to filter a soft amount of light to enhance the arched opening while blocking approximately 85% of the direct sunlight. A unique flush mounting design (no product inside the wood arch opening) that insures a goof proof installation. The NON-operable Sunburst™ arch is our most popular wood arch. It's slats allow a minimum of angled light inside the room but keep out most of the sun's heat. The NON-operable Slatburst™ arch has been engineered with 1/8" angled slat openings that filter out approximately 92% of direct sunlight. The simplicity of our Slatburst™ arch is what capture's the beauty and elegance of this new arch product. The engineered angled slat openings offer minimal sunlight to filter inside the room while a view to the outside can still be enjoyed. The unique beveled edges, which also adds projection to the window, reflects the high quality workmanship in each arch. The Slatburst™ arch is custom made for each window to cover the irregularities in the sheetrock openings guaranteeing no light gaps around the window. Our arches are pre-drilled with inset holes for outside mounting and are easily installed without brackets, giving them an enhanced look from the outside. Each arch is designed to cover the blind head rail or to fit on top of the shutter frame. A 100% energy efficient wood arch that resembles the Sunburst Arch except the slat openings are not completely cut through the arch, generating a total sunlight blocking feature. A great arch treatment to darken any room. Blackout wood arches may be used above existing rectangle windows to create today's arched window look. Please note that the arch design is on the room side only. If you would like the design to be on the street side of the arch, add $50 to the cost of your arch. New! E-Series Wood Arches can be made in any shape! Your choice of Grooved (Some Light) or Opaque (No Light). This wood arch makes a wonderful enhancement for any window style, from inside to the outside! All products are paint only and can be custom matched to any Sherwin Williams color. All inside mounted arches will require an inside mounting strip at an additional cost of $50 per arch. When pricing polygon shapes, remember to use the longest length for pricing. Bring more natural light into a home. The Window Therapist is on duty.. We can help with all your window problems..